It has been eight years since Batman (Christian Bale) took the blame for the death of Gotham's district attorney Harvey Dent. As Batman is now an outcast to the city, Bruce Wayne has become a recluse, rarely seen in public and succumbing to the multiple injuries he has endured as The Caped Crusader. Yet when Commissioner Gordon (Gary Oldman) is wounded, stumbling upon the sewer hideout of a masked villain named Bane (Tom Hardy), Batman is urged to return. Honest cop John Blake (Joseph Gordon-Levitt) persuades Bruce to don the mask again, and is given some new toys courtesy of Lucius Fox (Morgan Freeman). This is against Alfred's (Michael Caine) wishes, because he wants to Bruce to move on with his life. A lot of Bruce's wealth has gone to waste, due to Gotham's economic downfall when it was meant to be invested into clean energy device, organised by Miranda Tate (Marion Cotillard). However, Bruce is also the target of economic fraud, courtesy of a thief in Selina Kyle (Anne Hathaway), who is intertwined with a businessman named Daggett (Ben Mendelsohn). 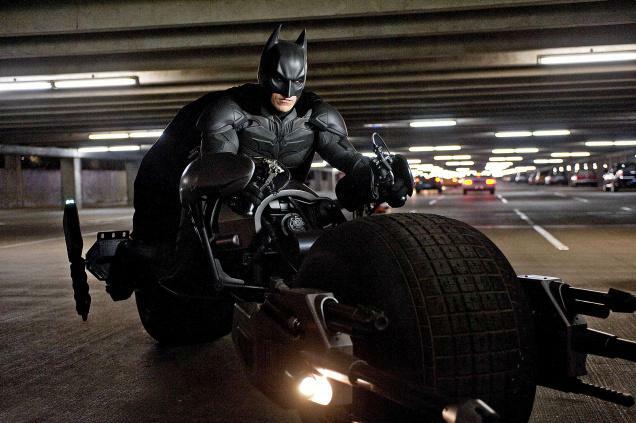 The Dark Knight Rises, the third and final Batman film directed by Christopher Nolan, is alone a gripping final chapter but equally an outstanding means of adjoining all three films in the series together. 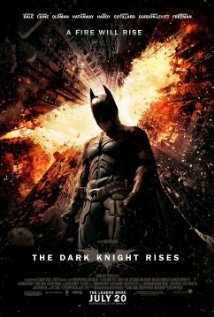 The success of the previous film lay in transcending the comic book world into a gritty crime story. Nolan contrasted the tactility of a post 9/11 universe with the chaotic and unpredictable torment of a clown figure. There is understandable hype about the quality of this film, considering the absence of the Joker here. The narrative could not be described as tidy but neither is it as over populated with characters or as senseless as some have recently claimed. There are numerous threads being upheld, some of which are only clarified as the film progresses and there's some rushed expositional dialogue used to fill in gaps in the story. It is essential to have some knowledge of the previous films because there are huge, surprising ties to both the first and second movie. More positively however, the film is briskly paced and never dull. It's an incredibly intense film, too dark and violent for small children, but never without a sense of purpose. Nolan has stated that this episode is specifically concerned with pain. In a screenplay by Nolan and his brother Jonathan, this is most tangible through both the physical and mental scarring of all the characters. Bruce's reclusiveness stems from losing Rachel Dawes but he is also physically distraught from the numerous injuries he has endured as Batman. Similarly, Alfred remembers the loss of Bruce's parents. Their death drives him not to let his master purge under his self-loathing and nihilistic outlook by embracing Batman again and using his alter ego as an outlet for death. Gotham City is also like a character in the story because it is tested physically and economically by Bane. 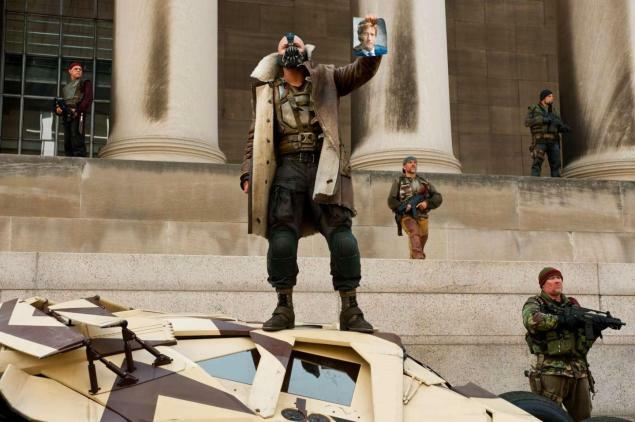 Bane's plan is not to outright destroy the city, but to isolate it and to test its physical and economical duration. The film could be called nostalgic in the way that it references any number of periods that suffered under the weight of physical and economical repression. The French Revolution, including Charles Dicken's novel A Tale of Two Cities (1859), is a huge inspiration for the film, as seen through some bizarre show trials against the wealthy. There are also nods to the GFC and economic fraud too but there's more fun to be had through the WWII references, as pockets of citizens in Gotham form resistance groups around the city to sabotage Bane's plan. There's a grisly mood to the material, particular when bodies are publicly strung up, but thankfully it's contrasted by moments of quiet humour. As much as people have deemed the film to relentlessly gloomy there are definitely some lighter moments of relief to be found. There are some surprising and humorous scenes early on, with Bruce mimicking Howard Hughes's twilight years, while the state of Wayne Manor could pass for Charles Foster Kane's Xanadu. There is also a very funny moment where Bruce opts for a medical check-up, being told that he doesn't actually have any cartilage in his shabby knees left, but still manages to rappel out of the hospital window anyway. As a spectacle there are several big set pieces, using thousands of extras instead of CGI, but I found the more intimate and claustrophobic battles the most effective and involving. The most distressing of which is an early confrontation between Batman and Bane, destined to be a classic scene, offering one of the most brutal melee fights in any comic book film. I found it agonising to watch because of its expert staging, the sense of helplessness, but most importantly because I cared about the wellbeing of the characters. That's a critical feat of this series, elevating it above similar comic adaptations. It also features in other moments of unbearable tension, including a brilliant climbing sequence, which itself acts as a clever metaphor for physical endurance. My involvement was also sparked by the quality of the performances, which are collectively terrific. The old favourites are in great form, particularly Bale and Caine, and it is their conflict which gives the film some emotional weight as they are divided over the uncertainty of the Wayne legacy. The new additions impress too, the best of which is Joseph Gordon-Levitt, whose character quickly finds mutual ground with Bruce through his own feelings of loss and abandonment. It is not a showy part but there's great conviction in his work that gives immense weight to the character. Hathaway entirely laps up the various facets of playing Selina Kyle (she's essentially Catwoman, but isn't called that and doesn't use a whip). She roundhouse kick's people in high heels, is entirely untrustworthy, can turn on tears whenever she wants, and yet in moments of danger you really care about her safety. Hardy is a little more conflicting as Bane. A lot has been said about his strange, muffled voice. With a mask covering most of his face, there's less acting and emotion in the character and he's not as fun as the Joker. While his voice and his accent are strange, at least most of his lines are now audible. The physical nature of his character and the menace he provides through is appearance compensates highly for being a less interesting character. In spite of a few flaws with the storytelling, I enjoyed the film immensely. Once you piece together the story, the characters and their safety matter, which makes the action more meaningful and engaging. As a Batman fan it is difficult to imagine how this series could have been translated into something more intensified, spectacular or human. One final note: is it a lack of imagination or pure arrogance that Warner Bros. is already considering rebooting the series again? Wasn't earning over a billion dollars in profit enough? Rebooting this series, with the standard of all three of Nolan's films to live up to, is a hole that not even Batman could climb out of.